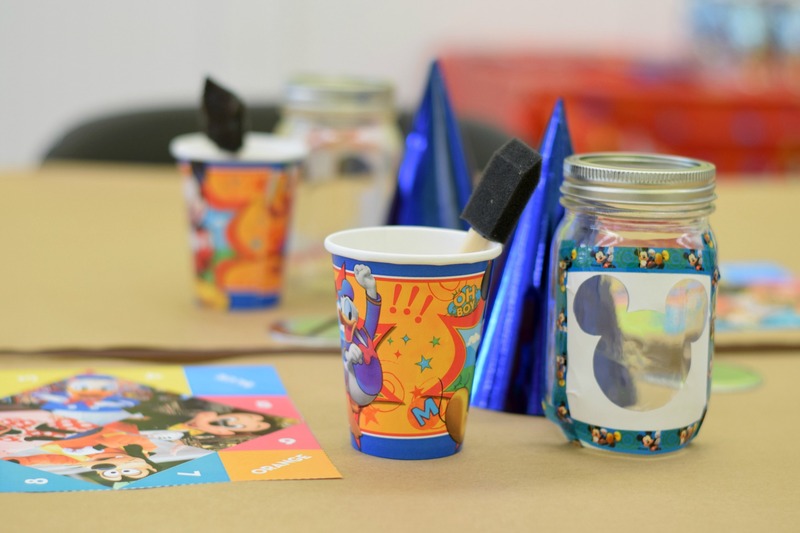 5 Tips for Throwing The Perfect Disney Craft Party was written in partnership with Disney. The opinions here expressed are my own. We threw a Disney craft party! Tatiana loves making crafts so when we got the news that we would be hosting a play date in partnership with Disney, I knew it had to be a Disney craft party. Disney and their amazing sponsors including HP, American Tourister, Pillow Pets, Pop Secret, and Softsoap sent us tons of supplies. The planning commenced once we had our theme and all of our supplies. 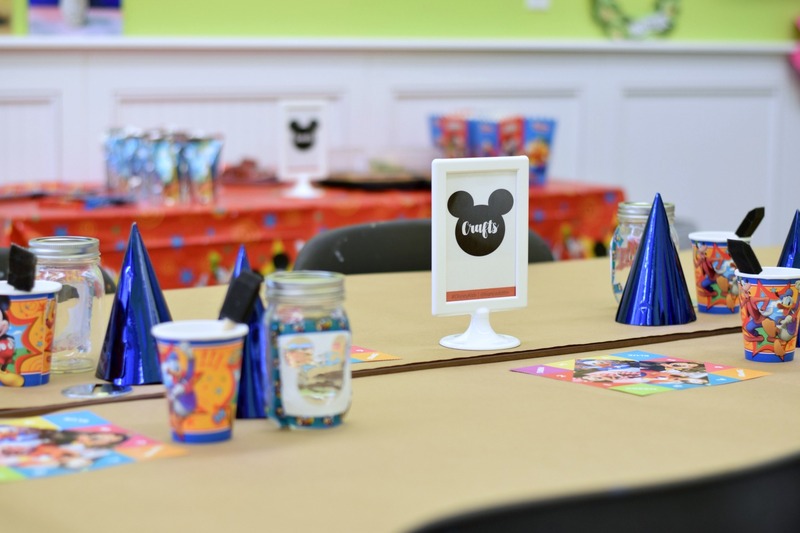 Throwing a Disney craft party is easier than you may think. Coming up with unique crafts may be a breeze for you if you’re a crafty person. If not, Pinterest will be your best friend. 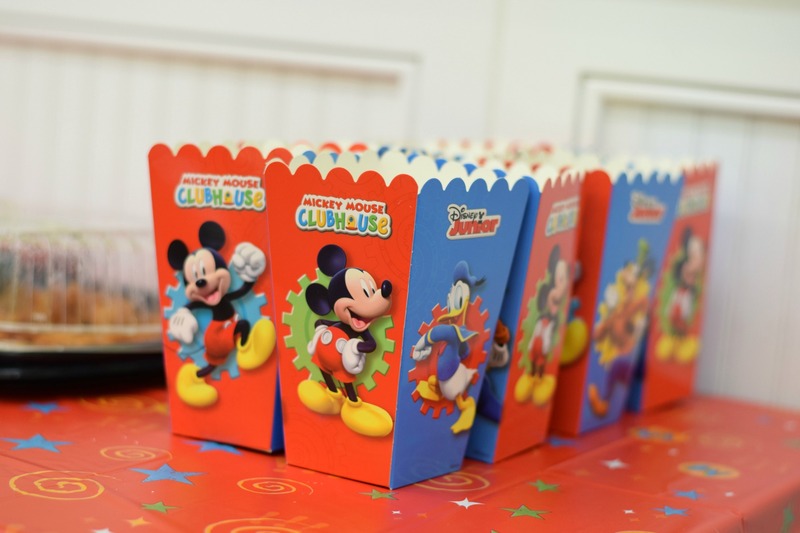 Here are some tips for planning a successful Disney craft party. 1.Secure a location. The first step to planning a Disney craft party is securing a location. We chose to host our party at our local Michael’s store. They allow the community to use the space for free. It was a craft party so it was a perfect fit. 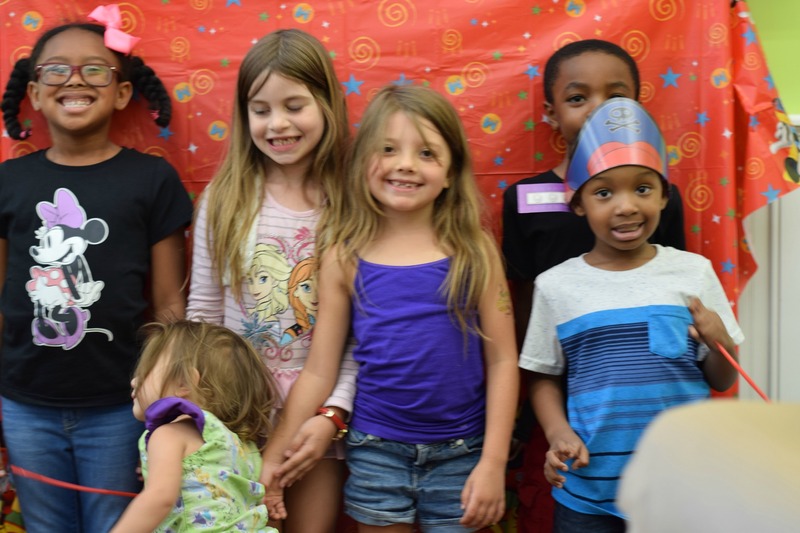 Other great venues for hosting your party are your home, a public park or the library. 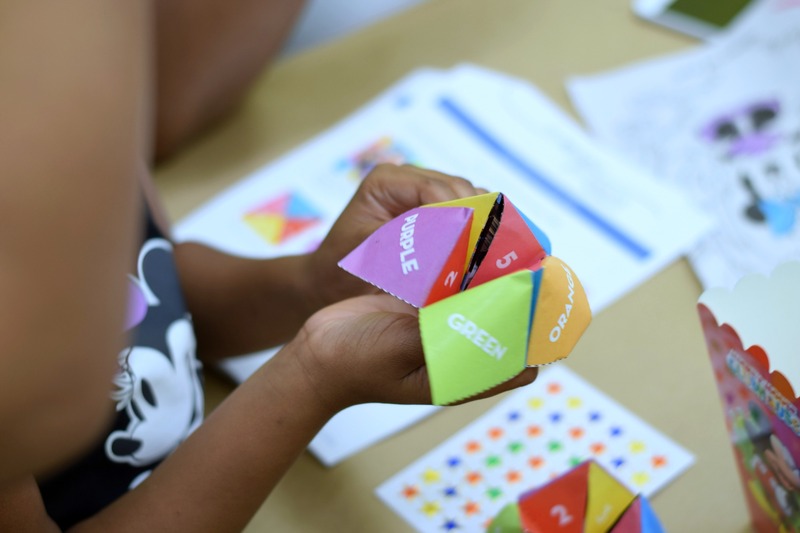 When choosing a location, you want to make sure that there are tables available where the kids can sit to actually make the crafts. 2. Make a guest list. We made a guest list once we had our venue, time, and date. We kept our guest list small and only invited 10 children. 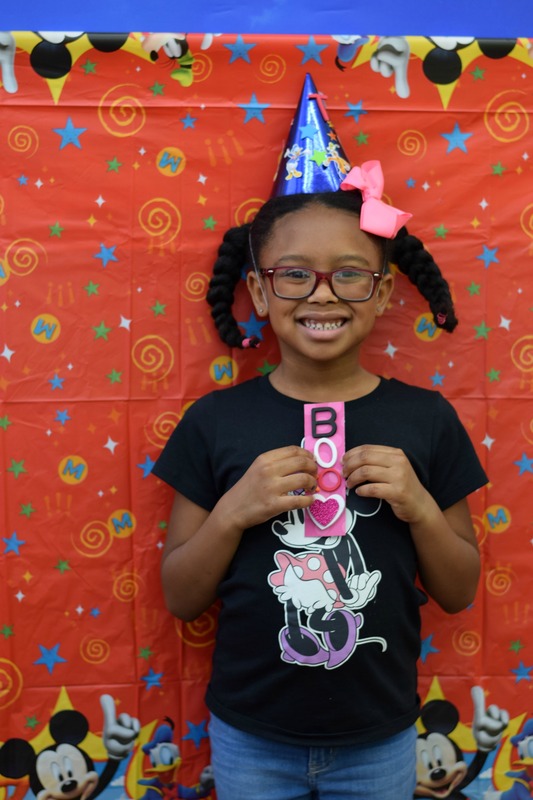 Keeping your craft party relevantly small is important because it allows the host to go around and help every child in case they need help with their craft. 3. Print and send the invitations. Once all of the details are set, the invitations are ready to be made. For our invitations, we used the HP Card and Invitation Kit. The kit comes with 25 glossy 5×7 rounded corner invitations and envelopes. The great thing about these invitations is that you can easily find a Disney themed invitation design for free using the HP Photo Creations software or you can create your own design. We opted to create our own design to match our classic black and white Mickey Mouse theme. In addition to paper invitations, we made a Facebook event to keep guests updated with any party changes. Once your invitations are sent out, the RSVPs will begin to roll in. 4. Prep any crafts for the party. 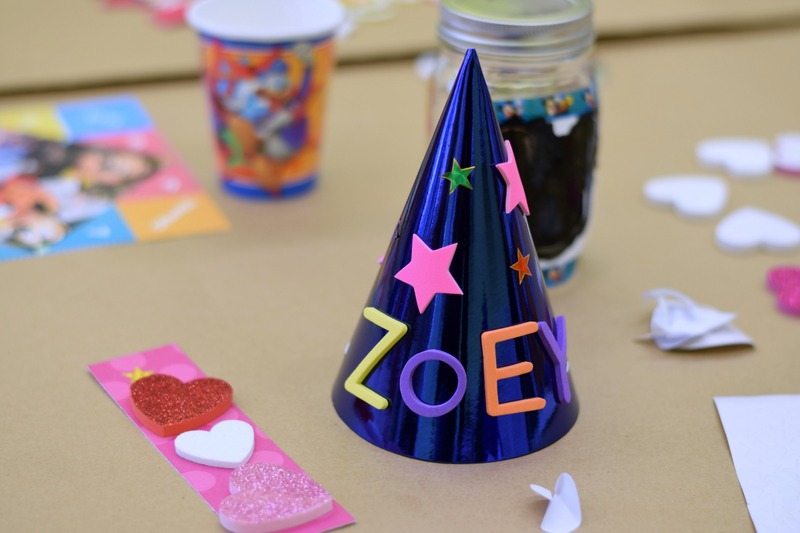 The crafts we chose to create at our party were sorcerer hats, Mickey Mouse mason jar piggy banks, Mickey and Minnie bookmarks, and fortune tellers. In order to make things go smoother at the party, we cut Mickey Mouse stencils out for the piggy banks and taped them onto the mason jars. If you’d rather use chalkboard stickers instead of paint, you can snag these Mickey stickers here. Lastly, pre-cut any stencils or patterns in advance of the party so that the kids aren’t having to handle scissors. 5. Don’t forget the food. A party isn’t a party without the food. Oh, and don’t forget the dessert! For our Disney craft party we kept the food super simple with something we knew all of the kids would love, Chick-Fil-A. We also had popcorn and juice boxes. Light snacks are always the perfect things to serve at a party because the kids will be too busy playing and crafting to eat. More than likely they will be snacking throughout the festivities. 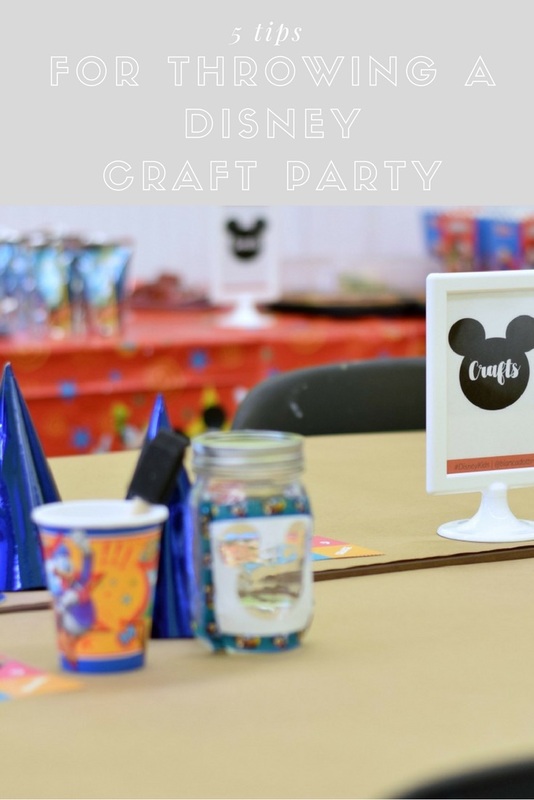 After you’ve got all of your party prep done, you’re ready to host your first Disney craft party. Remember to have fun and take lots of photos. What I love most about hosting a craft party is that you can forget about the useless goody bags filled with candy. Instead, the kids will be taking things home that they can actually put to use. 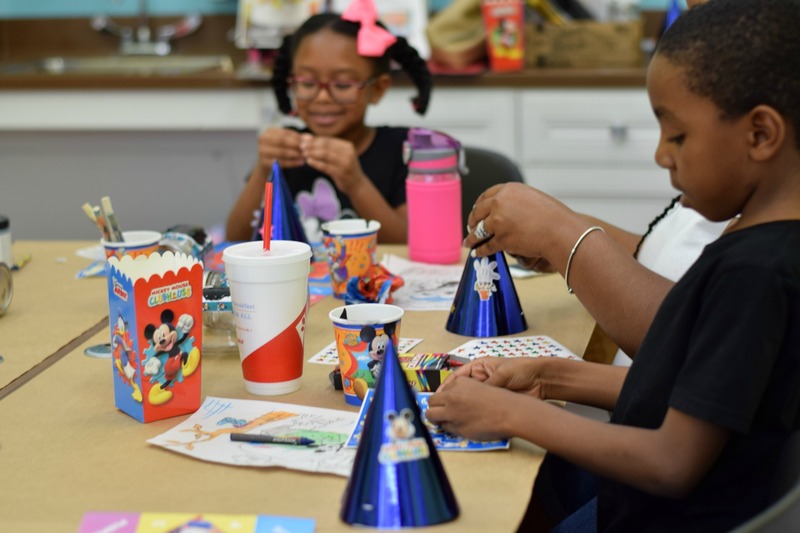 Check out the photos from our Disney craft party! Grab your free Disney craft party planner printable here. Now, it’s time to start planning your very own Disney craft party. What are some fun craft ideas you have?